With just 10 days to go until the Florida Gators‘ 2011-12 football season gets underway, the ninth part of OGGOA‘s new series, The Countdown, takes a look at those players expected to contribute on the field wearing jersey numbers ranging from 19-10. Quick Bio: An Under Armour High School All-American entering his fourth year at Florida, Sturgis majors in sport management and hopes to continue leading the Gators special teams unit as the starting kicker. A kickoff specialist during his freshman year, he became the primary place kicker in 2009 and hit 73.3 percent of his field goals (long: 56) and 44-of-47 extra points to score 110 points for Florida. 2010 Season: Sturgis did not get an opportunity to flourish like he wanted in his second season as the Gators’ starter. Suffering through back pain early in the season, he was forced to undergo surgery after just four games and was eventually awarded a medical redshirt by the NCAA. Sturgis hit just 2-of-4 field goal attempts and 19-of-21 extra points before being sidelined for the remainder of the year. Quick Bio: A four-star recruit coming out of high school who was considered one of the best players at his position nationally, Brissett participated in the U.S. Army All-American Bowl and enrolled at Florida over the summer after deciding to play high school basketball in the spring. A graduate of Dwyer High School, he is good friends with sophomore safety Matt Elam and was also teammates with redshirt freshman tight end Gerald Christian and sophomore wide receiver Robert Clark in high school. 2011 Outlook: A bit behind the eight ball considering fellow freshman QB Jeff Driskel enrolled early and got a handle on the offense months before him, Brissett is currently competing with redshirt freshman Tyler Murphy to be the No. 3 quarterback. Praised for his mobility and quick grasp of the playbook, he will probably be competing with Driskel throughout his entire career with the Gators but is unlikely to pass him for the back-up quarterback job this season. Quick Bio: An early enrollee who joined Florida in January, Driskel is a former five-star recruit who was the Gatorade Florida Player of the Year and considered by most to be the No. 1 quarterback in the country in 2011.He threw for 1,819 yards and 15 touchdowns while rushing for 1,333 yards and 20 touchdowns during his senior season and earned an Under Armour All-American nod for his efforts. Quick Bio: It’s a pretty gutsy move to don the No. 15 in the orange and blue, especially as a freshman, but the former four-star recruit hopes he can be just as impressive as his predecessor in that jersey. Purifoy was one of the best players at his position coming out of high school and chose to play for Florida over Alabama, Auburn and Miami (among others). Quick Bio/2010 Season: A U.S. Army All-American and four-star recruit, Watkins is a social and behavioral sciences major who played in 10 games last year and had a career-high three tackles in the last contest of the season. Watkins worked primarily on special teams in 2010 but also saw some time in the secondary. 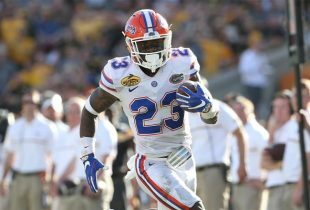 2011 Outlook: With Elam and junior Josh Evans pretty much set as the Gators’ starters at safety, Watkins will begin the 2011 season in a reserve role alongside redshirt freshman Joshua Shaw. 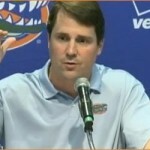 He is enjoying Muschamp’s defense and hopes to continue following his instructions on how he can succeed in it. “[He tells me] just to be a football player. Everything is not going to be what it is on paper – just be an athlete out there,” Watkins said. Quick Bio: Originally a commitment in the 2008 recruiting class, Finley chose to attend prep school for a year in order to get his grades up so he could enroll. The Under Armour All-American and four-star recruit, who signed as a safety, joined the team in 2009 and notched seven tackles (five solo) in 10 games. 2010 Season: Moved from safety to linebacker, Finley saw the field the vast majority of the time on special teams. He was a primary fixture on the kickoff coverage and kickoff return units and accumulated seven tackles (five solo) over the course of four games. Finely missed the final seven contests of the season after fracturing his collarbone against LSU and was awarded a medical redshirt by the NCAA. Quick Bio: A five-star quarterback, U.S. Army All-American and the Gatorade National Player of the Year in 2006, Brantley was one of the most highly recruited players currently on Florida’s roster. The humanities and letters major redshirted as a true freshman but played quite well as a reserve during his second and third seasons. Combined, Brantley completed 54-of-76 pass attempts for 645 yards with 10 touchdowns and just one interception as Tim Tebow’s back-up. 2010 Season: Stepping into a starting role for the first time in his career, Brantley hoped the offense would be tailored to better suit his talents. Instead, the pro-style quarterback was asked to run a spread offense and struggled mightily. He completed only 60.8 percent of his passes (200-of-329) for 2,061 yards with nine TDs and 10 INTs over the course of the season. While Brantley remained the “starter” throughout the year, he ended up becoming part of a three-quarterback rotation halfway through the season and played mostly on third down, when the team was behind or in obvious passing situations. 2011 Outlook: After seriously considering transferring in the offseason, Brantley decided to stick with the Gators and (according to those who actually get to see him daily) has had a resurgence under new offensive coordinator Charlie Weis. Coaches and players have unanimously lauded his ability, consistency, improvement, leadership, arm strength and overall understanding of Weis’s offense. Muschamp has noted on numerous occasions that Brantley is not only his starter but significantly ahead (in terms of development) of the other passers. He has added that the offseason goal is to improve the protection in front of him and playmakers around him, insinuating that he is as solid a player as the offense has on its roster. Quick Bio/2010 Season: A four-star quarterback coming out of high school, Reed dressed for five games in 2009 but did not see any action. The social and behavioral sciences major officially transitioned over to tight end in 2010 but wound up only starting four games at that position as he instead played more of a hybrid role and saw plenty of time at quarterback. Reed caught six passes for 79 yards and a touchdown last year but also rushed 77 times for 328 yards and five scores and completed 26-of-46 passes for 252 yards with three TDs an interception. Quick Bio/2010 Season: A two-star recruit , Murphy spent last year as a member of the scout team that helped the Gators prepare for their opponents. One of four quarterbacks on scholarship in 2010, the social and behavioral sciences major was the only one who did not end up seeing some game action. I don’t do every player, just those who are likely to see the field or play a reserve role.